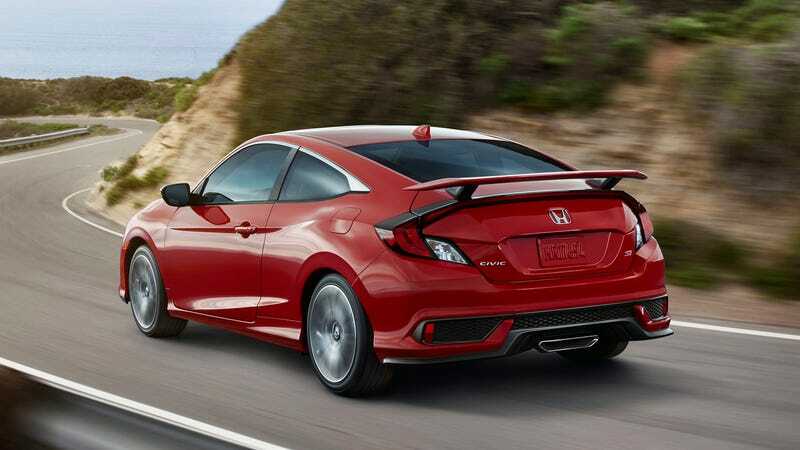 The Honda Civic Si coupe and sedan will occupy the spot in between the regular Civic and the ridiculous Type R. Despite being the first turbocharged Si, the new model has the same 205 horsepower output of the car it replaces. Lame. The more I look at this thing, the more I like it. Recently Honda “leaked” the torque figures for the Si and it was revealed to be a pretty decent 192 lb-ft. That’s a nice bump from the 170 lb-ft of the 2.4-liter motor found in the 9th generation car. Unfortunately, Honda didn’t think it was necessary to surpass the 205 HP that the last car had. Sure the power will come it a bit lower and be more easily accessed, but then again the character of the Si has always been a high-revving car, so we will have to wait and see as to how this one feels behind the wheel. The good news is that the Si coupe and sedan will have some tricks up their sleeves that the standard Civic does not, includng: a helical limited-slip differential, larger 12.3-inch front brake rotors and wider 235/40 R18 tires with a performance tire option, adaptive dampers and other suspension upgrades. The Si’s suspension tuning combined with the new (woo!) variable steering ratios will be integrated into selectable driving modes, that can adjust the aggressiveness of the car. Get excited! The exterior gets the expected 18” wheels, spoiler, and other sporty bits to add some visual flair over the standard Civic. The Si also includes upgrades such as an electronic parking brake, walk away door locking, dual-zone automatic climate control, heated front seats, rain-sensing wipers. Here is a video that shows the awesome dynamism of the new Civic Si. Honda says pricing for the new Si will be in the “mid-$20,00 range” which puts the Si well within striking distance of the Volkswagen GTI and Ford Focus ST, both of which bring a lot more firepower to the table.